According to law enforcement agencies, the total number of supporters of radical Islam in Germany is 24 thousand people, although they were three times less two years ago. Now, their number is close to two divisions. In Germany, the number of supporters of radical Islam is dramatically increasing. They have their own mosques. They have their own dress code which has never existed in the West. They look aggressively at the countries that have sheltered them for "humanitarian reasons", and have given them generous social benefits and provided the opportunity to be Muslims rather than they have in their countries of their origin, where sometimes a long beard or hijab can be suspected and punished. 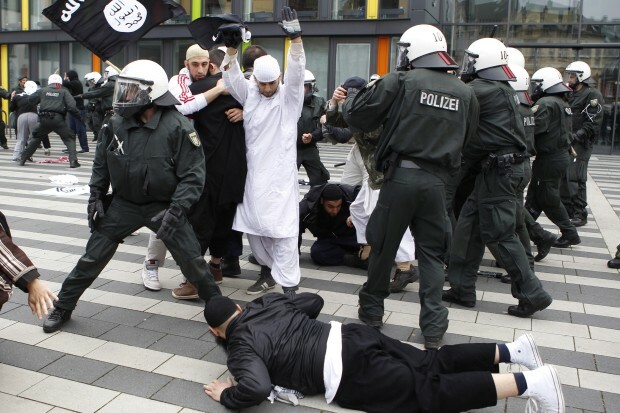 These people in Germany are often called Salafis, and not only Germans, who love eating delicacies from pork, drinking beer, are afraid of them, but also other Muslims. These people got Muslims afraid with their radicalism, deny a number of Islamic traditions, including Sufism, which should be eliminated, according to them, in order to "purify" the religion of the prophet. At the same time, they consider all the rest that is beyond the world of Islam as an absolute territory of sin, which must be destroyed along with all sinners. In Germany, two divisions of these stubborn Islamists are already waiting for the signal to start active operations. The German life seems boring and overwhelming to them and, apparently, they are eager to apply new technologies received in Syria and Iraq. There, they were behaving as kings and could do everything they wanted with "infidel" or "deviator". And, in Germany, they are forced to tolerate its citizens and this is unbearable for them. Sometimes someone cannot stand it anymore and opens fire ahead of time, and even without an order. Where did so many Salafis come from? In 2015, about 1 million illegal migrants from all over the world entered the Federal Republic of Germany, mostly without documents. No one checked these people under the pretext of special circumstances caused by the humanitarian crisis. The authorities believed them: where they come from, how old they are and etc. It is clear that at least a few percent of the 1 million intruders are the real terrorists who arrived in Germany in order to take up the same thing they did at home. A significant part of the "refugees" are potential terrorists. When they find that their dreams of a rich life and life-long free benefits in Germany have not been justified, that they cannot force the Germans to do what they want, they quickly "radicalize" and will go on the warpath sooner or later. This is also the case if migrants do not receive refugee status and they are threatened with expulsion from the country. The most famous terrorist attacks in Germany were committed by people who were denied to have "asylum". This was the reason for the terrorist attack on the Christmas market in Berlin at the end of last year. During this attack, 12 people were killed and about fifty were wounded. Tunisian AnisAmri "took revenge" for refusing to become a Bundesburger, and crushed Germans and foreign guests of Berlin by a truck. In July 2016, a Syrian, whose application for "asylum" was rejected, blew himself up at a music festival in Bavaria - he killed himself and wounded 15 people. If it had not been for the police actions, there could have been much more victims. He called himself a member of ISIS and announced a planned terrorist act in a video distributed online. Almost at the same time, a "refugee" from Afghanistan, whom no one sent anywhere, attacked the passengers with an ax and a knife in a suburban train in Bavaria. Four people were seriously injured. These people have wanted to become German. However, there are terrorists in their midst. And it's not just men. In February 2016, a young Muslim woman, whose father was German who had been converted to Islam and a mother from Morocco, seriously injured a policeman at the Hanover station.She stabbed the guard with a knife in his throat. And this is not surprising. A considerable part of the Islamic communities in German refuses to integrate. They perceive the world around them as evil and think that everything is permitted in relation to it. And people, who receive very generous social state assistance, do nothing, travel around the world, usually think and behave in this way. This would simply not be possible in the countries, from where these Islamists or their ancestors moved to Germany. Instead, they would work hard for pennies there. And it turns out to be a kind of terrorist synergy. Wild and embittered inhabitants of the Islamist ghettos in the Germany meet with thousands of immigrants coming from the Muslim world. They share the same hate for the traditions and lifestyle of Europeans and IT technologies help them do it. They do not have any work and what they only do is inflame themselves with hatred for the world around them. The German police, exhausted and spent colossal resources on them, are forced to watch when an Islamist "gets ready for" a specific villainy and fear to stop him until there is incontrovertible evidence of the upcoming terrorist attack. These attacks can often be prevented, and usually, the public is not informed about this. However, due to the rapid growth of Salafis in the Federal Republic of Germany, this scheme will soon stop working: it is impossible to track such a huge number of potential terrorists. And the authorities are not aware of all dangerous subjects. There have been almost no major terrorist attacks in Germany, such as in Belgium or France but this is only for the time being. The problem of Islamic terrorism in Europe is complex. The most important aspect is the problem of illegal migration: the more "illegal" people are, the higher the threat of terrorism is. For several years, the official authorities of Germany have been trying to deny persistently this obvious connection, which ordinary Germans perfectly see. However, following the failure of the mainstream parties to tolerate illegal migration, Berlin has to take certain measures in this regard. As the German media reported today, Christian Democrats, represented by the two parties of the CDU and CSU, which have a single fraction in the parliament, agreed on imposing an upper limit on the number of "refugees" accepted by Germany. It will be up to 200 thousand people a year, as the Prime Minister of Bavaria and the leader of the CSU Horst Seehofer demanded long ago. There is, however, an exception in the case of "humanitarian catastrophes". The Secretary-General of the Bavarian "sister" CDU, Andreas Scheuer, confirmed that the CSU refused to enter the new ruling coalition without reaching the deal. The Bavarian conservatives asked persistently Angela Merkel to stop pushing the CDU to the left - more "healthy patriotism and love of homeland." After a failure in the elections, they were heard in Berlin. According to the polls, two-thirds of Germans are demanding to restrict the reception of "refugees", as terrorists often come to Germany under the guise of “refugees”. And it is getting harder and harder to ignore the voice of the people. Poles are also concerned about the problem of illegal migration and Islamization in Poland.They have no complexes, except one, that they are victims of their neighbors, Germans, and, therefore, do not want to experience any more inconveniences from strangers. Polish deeply believers also fear for the fate of European Christianity, especially Catholicism, and see that Islam will become the predominant religion of former Europe due to the current migration and demographic trends in the foreseeable future. On Saturday, Poland hosted the Day of Prayers, in which hundreds of thousands of Catholics took part. They prayed for the salvation of Poland and the whole Christian world. People lined up in long lines to pray in the fields, on the streets of cities, including in Warsaw, on the Baltic beaches and the borders of the country. The participants of the event stressed in numerous interviews that they prayed that Christianity would not disappear in Europe. "Islam wants to destroy Europe, Muslims want to convert us to their faith," one of the participants of prayers told the AP agency. It is curious that the Day of Prayer is dated to the anniversary of the victory of the Christian fleet over the Ottoman Turks and their North African allies in the sea battle of Lepanto near the coast of Greece in 1571. Is it really that Western Europe, finally, feels its self-preservation?